October has started the exact same way September left off with Redfish galore. in the years past i have changed the name from October to “Redtober” because the massive amount of reds caught during the month. Well we are two days in to the month and that saying has proved to be true once again. All this great red fishing started back in 2009 when the Snook population died off quite a bit due to the very cold water temps. Redfish do very well in a variety of temperatures and the cold didn’t bother them, as a matter of fact with less competition from the snook they really took off! Now a few years later we are reaping the rewards of that natural occurrence. They are still in the exact places they were in September and the numbers haven’t changed either. Look for them tailing on falling tides or in schools, on high tides fish the trees and oyster bars. Go with the pinfish still and use the pilchards you will get on the flats for chum. 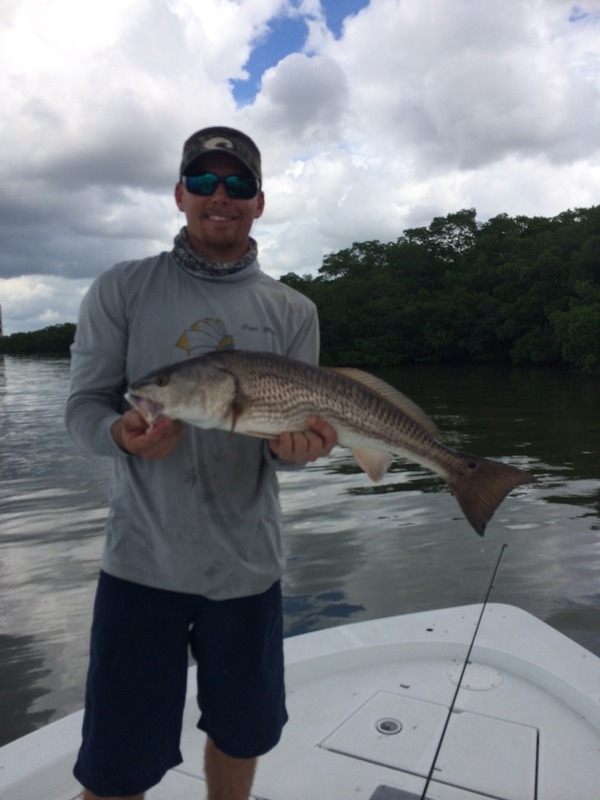 The average size is 24″ but we have caught some over slot and some others have reported large almost 40″ reds being caught in Estero Bay. Season is about to really kick in to gear for all the guides here so if you are planning a trip with someone book soon because there won’t be many spots left. Get out on the water and catch some fish!